The firm of Kevin Roche John Dinkeloo and Associates LLC (KRJDA), located just outside New Haven, Connecticut, is a direct outgrowth of Eero Saarinen and Associates, which was originally established in 1950. 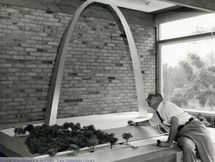 When Eero Saarinen died in September 1961, the practice was taken over by Kevin Roche and John Dinkeloo with Kevin Roche resolving the remaining design issues of the twelve major projects on which Mr. Saarinen had been working at the time of his death. These included the Dulles International Airport, the St. Louis Gateway Arch, and the CBS Headquarters in New York. In 1966 the firm became Kevin Roche John Dinkeloo and Associate. John Dinkeloo died in June of 1981, and Mr. Roche continues the practice with the original firm name. The firm now consists of three principals: Kevin Roche, FAIA Philip Kinsella, AlA and James Owens, AlA. In addition, there is a total staff of 50. Kevin Roche John Dinkeloo and Associates provides complete master planning, programming, architectural design, interior design, working drawings, specification and construction administration services. 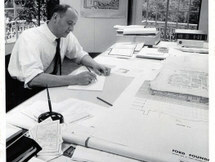 Kevin Roche is responsible for all of the designs for the firm. he firm received the American Institute of Architects 1974 Architectural Firm Award and more recently the firm was the recipient of the 1995 American Institute of Architect’s 25-Year Award for the Ford Foundation Headquarters in New York City. In 1982, Kevin Roche received the Pritzker Architectural Prize and in 1993, he received the AlA Gold Medal.